Mustique is a luxury condo development on the gentle shores of Little Lagoon in Gulf Shores, AL. The lagoon is best known for its plentiful fishing holes and majestic sunsets. It maintains a private, covered fishing pier for its residents and guests, an ideal spot to reel in a flounder or cast for mullet. The north end is dedicated to the beauty of the Gulf of Mexico, which can be seen from the majority of the main living areas, as well as the master bedroom. This West Beach development is designed with the comforts of a primary residence in mind. The spacious 2500 square foot floor plan is an open masterpiece of luxurious functionality. A large granite island separates the kitchen from the living room, an ideal placement for entertaining guests or those families who find themselves congregating in the kitchen. Each bedroom has their own dedicated bathroom, so privacy does not have to be sacrificed for guests during their visits to the beach. 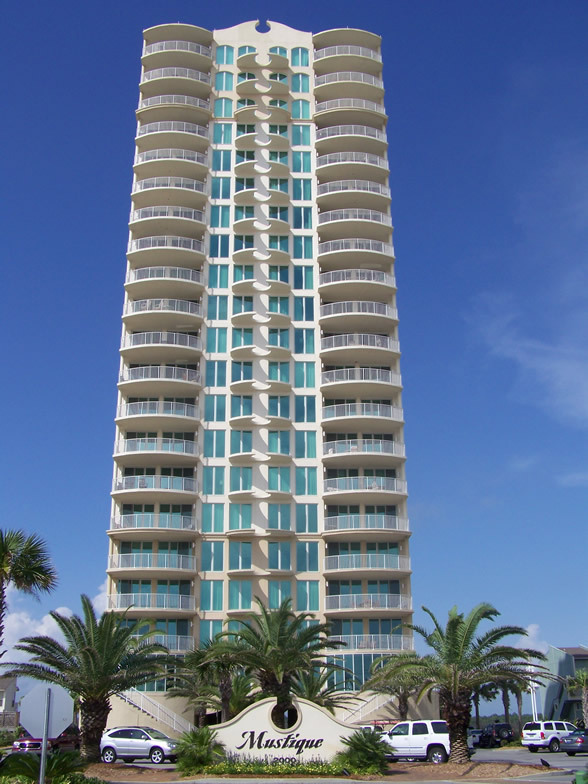 You will be just across the street from the beach, with deeded access to the gulf sand. On the lagoon side, there is a large pool and sundeck area. This is low density condominium development, with just two units per floor, totaling 38 units. Mustique Gulf Shores AL condo tours with the Jason Will Real Estate Team 251-866-6464.